This automatic pasta maker comes with 8 different pasta discs. If you want a machine that comes with the most pasta shapes, this is the best model for you. Can make 3lbs of pasta from start to finish in 20 minutes. Mixes, kneads, and feeds the dough through your pasta shape of choice. Includes 8 different pasta shapes instead of 4 like many other models. If you’re looking for a fully functioning, high quality, manual pasta maker this is one of the best you can buy. Manufactured by Italian company Marcato Atala with high quality parts and craftsmanship. Although the motor drive is sold separately, this machine is capable of switching to motor functions if your arms get tired of hand cranking. Includes a 1o year manufacturers warranty covering parts and labors for any defects. This old fashioned, Italian made pasta machine is the same style used by home cooks throughout Italy. Features a chic, retro design modeled after traditional styles used throughout Italy. This simple, manual machine helps you make pasta with ease. Your most basic pasta making priorities are covered: solid sheets, linguini style strips, or stuffed and crimped ravioli. When it comes to electric machines, the Philips Avance Noodle and Pasta maker is one of the best you can buy. This electric machine makes pasta from start to finish in as little as 20 minutes. The philips avance machine mixes, kneads, and feeds dough into different shapes for you. Includes a handy cleaning tool for nooks and crannies. All parts are dishwasher safe. If you’re looking for an affordable pasta machine, look no further than the Oxgord Hand Crank Pasta Maker. The best manual pasta maker you can buy for under $50. All parts are detachable and dishwasher safe for easy cleaning. Includes 9 different thickness preferences and 2 blades to make 5 different types of pasta. 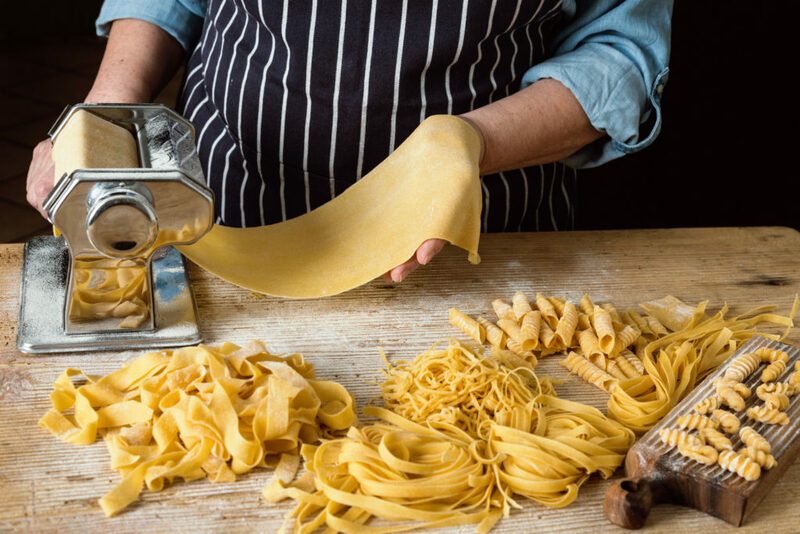 If you’re a home cook who’s toying with the idea of buying the best pasta maker to use at home, you need to read our buying guide first. If you’re someone who’s never considered buying a pasta maker, you might want to reconsider. Pasta makers yield fresh, better tasting pasta noodles with simple, affordable ingredients. While store bought pasta is cheap and convenient, surprisingly owning your own pasta machine can actually save you money in the long run. Using one also isn’t as much effort as you probably imagine. Manual pasta makers will give the home cooks a more authentic pasta making experience, while an automatic machine can help even the novice chef, who can can barely make a sandwich, make quality pasta with ease. Continue reading to help you decide which model and style is best for you. This old fashioned, Italian made pasta machine is the same style used by home cooks throughout Italy. It’s simple to use, and small enough to store in small spaces. The manual style features a chrome and wood hand crank, and a base available in either silver or retro red. The base clamps firmly to your kitchen counter tops to help you crank the lever without straining and rubber feet help prevent the machine from sliding. The Imperia pasta maker comes with two different pasta rollers, one for solid pasta sheets and one for making linguini or fetuccini. It also features to help stuff and crimp two solid sheets of pasta dough into ravioli. 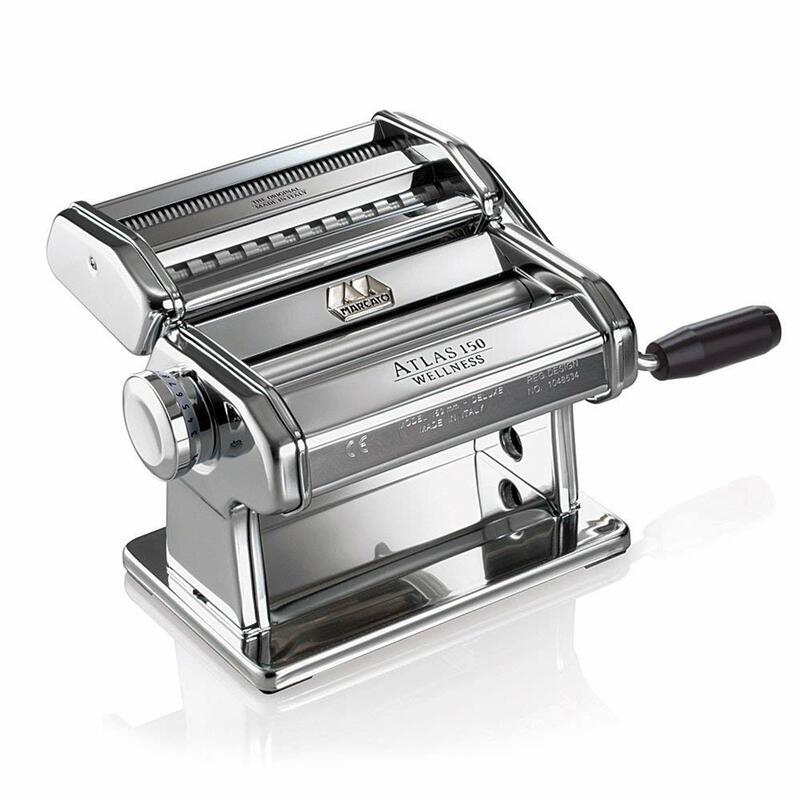 Traditional Design: this machine features a chic, retro design modeled after traditional styles used throughout Italy. 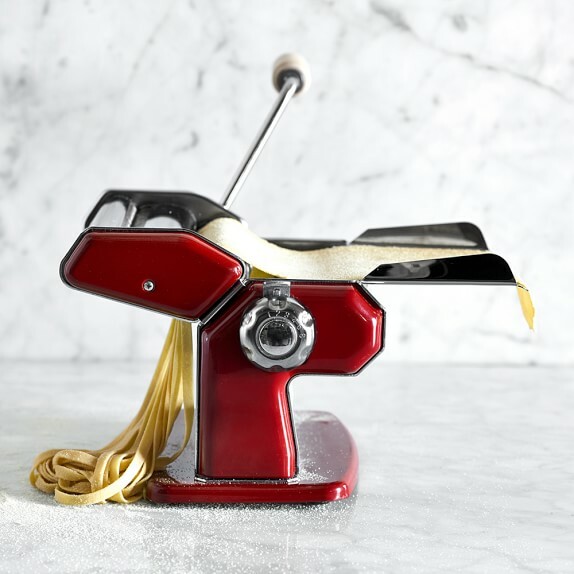 Easy to Use: the simple, manual machine helps you make pasta with ease. No extra buttons, functions, or features to worry about. All you have to do is roll your dough. Pasta Versatility: you have your most basic pasta making priorities covers: solid sheets, linguini style strips, or stuffed and crimped ravioli. Need Maintenance: because this is a chrome manual model, you’ll need to apply oil in between the rollers to keep it running smoothly. More Parts to Clean: to clean this machine you need to brush away flour and dust from the exterior and hand clean clean all parts with water and detergent to prevent rusting. Limited functions: while this manual model gets the job done, an automatic machine has more pasta making functions and styles to try. If you’re looking for an affordable pasta machine, look no further than the Oxgord Hand Crank Pasta Maker. It looks and functions almost identically to more expensive models, but is significantly cheaper. While the materials aren’t as high quality as brands like Marcato Atlas or Philips, it still gets the jobs done. The Oxgard pasta maker is a traditional manual model that comes with 3 different blade attachments. 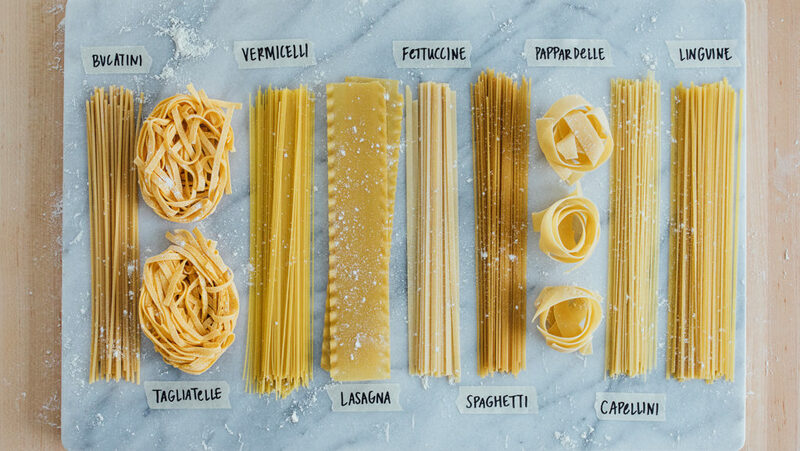 You can also select from 9 different thickness preferences to make spaghetti, linguine, fettuccini, angel hair, and solid pasta sheets at home. The parts and base are made of stainless steel and detachable for easy clean up. Affordable Price: this is the best manual pasta maker you can buy for under $50. Easy Clean Up: all parts are detachable and dishwasher safe for easy cleaning. Some Customization: although it doesn’t have as many features as electric models, it includes 9 different thickness preferences and 2 blades to make 5 different types of pasta. Cheaper materials: the Oxgord pasta maker is more affordable because it isn’t manufactured with the same quality of materials or expertise as other bands. Isn’t as Sturdy: while this machine will make delicious pasta, it doesn’t clamp as tightly to countertops as other models do. No motorized options: some manual models come with motorized attachments if you don’t want to hand crank. This one doesn’t. 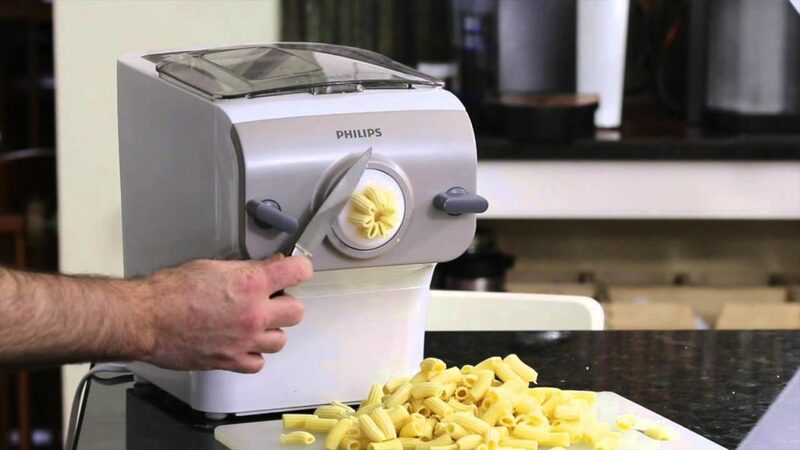 When it comes to electric machines, Philips makes the best pasta maker. The avance model is a powerful, automatic machine that makes hand free pasta in as little as 20 minutes. It mixes, kneads, and will even feed the dough for you through the pasta shapes of your choice. All you need to do is pour the ingredients in and adjust the pasta length to your preference once it’s finished. It couldn’t be easier to make pasta at home. This machine includes 4 discs shapes to make spaghetti, fettuccini, penne, and lasagna sheets. All parts are detachable and dishwasher for easy cleaning. A cleaning tool is also included to get stuck dough out of hard to reach places. Fast: this electric machine makes pasta from start to finish in as little as 20 minutes. Easy to Use: hands free pasta making. The philips avance model mixes, kneads, and feeds dough into different shapes for you. Easy Cleaning: includes a handy cleaning tool for knooks and crannies. All parts are dishwasher safe. Expensive: while you can buy high quality manual models for under $100, this automatic model will set you back around $200. No Manual Option: although a fully electric model is convenient if you’re nostalgic for a traditional pasta making experience a manual model is better. Fewer Pasta Shapes: it does include 4 different pasta making discs, but other automatic models include up to 8. If you’re looking for a fully functioning, high quality, manual pasta maker this is one of the best you can buy. It’s also under $100, making it relatively affordable for a small kitchen appliance. Marcato Atala is an Italian appliance company that uses high-quality materials and offers a 10 year manufacturers warranty on their products. This manual machine is often called the ferrari of pasta makers. 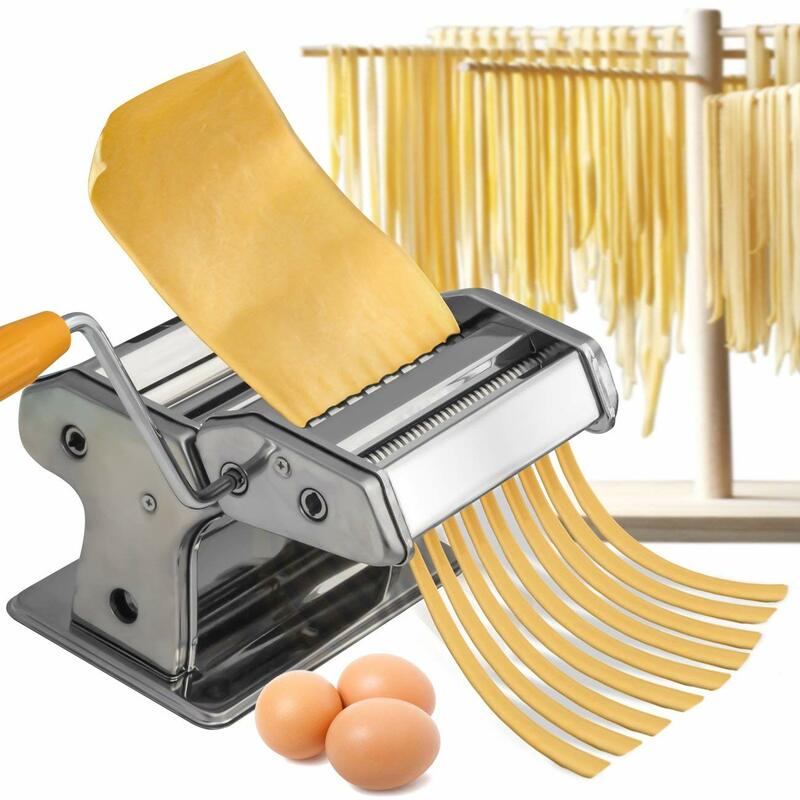 It rolls and cuts pasta noodles fettuccini, lasagna, and taglioli and features 10 different thickness preference. More pasta shapes and a pasta drive motor are sold separately to give you the option of switching to motor functions instead of using a hand crank. High Quality: manufactured by Italian company Marcato Atala with high quality parts and craftsmanship. Motor Function Capability: although the motor drive is sold separately, this machine is capable of switching to motor functions if your arms get tired of hand cranking. 10 Year Warranty: includes a 1o year manufacturers warranty covering parts and labors for any defects. Limited Pasta Shapes: only comes with three pasta shape options, although you can purchase more separately. Requires Maintenance: for best upkeep you’ll need to oil the rollers and hand wash separate parts. 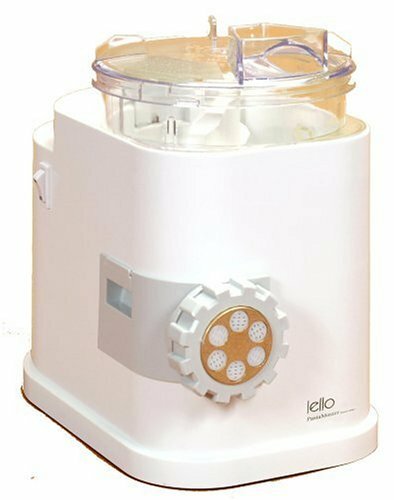 This automatic pasta maker comes with 8 different pasta discs and is a little more affordable than Philips models. If you want a machine that comes with the most pasta shapes, this is the best model for you. Similar to other automatic styles, this machine does all the work for. You simply pour in the ingredients and it mixes, kneads, and pulls dough into shapes for you. This machine is capable of making 3lbs of pasta in around 20 minutes. Pasta styles include spaghetti, angel hair, linguine, macaroni, bucatini, fettuccini, lasagna, and solid pasta sheets. Fast: this manual machine can make 3lbs of pasta from start to finish in 20 minutes. Convenient: it mixes, kneads, and feeds the dough through your pasta shape of choice. Variety of Pasta Shapes: includes 8 different pasta shapes instead of 4 like many other models. Lower Quality Discs: although it included 8 different pasta discs, they’re made of plastic making them more likely to break and gives you a rougher pasta texture. Requires Practice: you’ll need to experiment with ingredient proportions for different pasta styles. Nosy: some reviews note that this machine is much nosier than other automatic models. If you’ve already shopped around for pasta makers you’ve likely noticed there are two main models you can buy: electric or manual. These styles are also knowns as automatic or hand crank pasta makers. 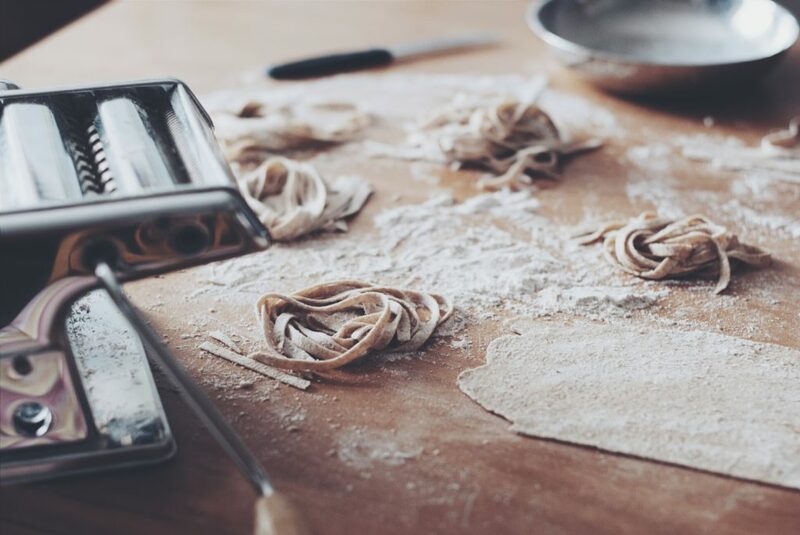 Here’s a breakdown of the differences between the two to help you make the best purchase for all your pasta making needs. Like the name suggests electric models need to be plugged in. They’re the hands free, fancier way of making pasta at home. These models are perfect for anyone who loves high tech kitchen gadgets or for novice chefs who don’t want to mix, knead, and feed their own dough through the machine. Electric models are also pricier. Most automatic machines cost upwards or $200. Some are closer to $500, but you’re paying for convenience. All you need to do to make fresh pasta at home is pour the ingredients in and choose your pasta shape. These machines do everything else for you and are capable of making about 2-3lbs of pasta noodles in under 20 minutes. Some models will even walk you through the ingredients and proportions you should add for each pasta style. Manual pasta makers are the traditional, old school way to make pasta. If you’re a fan of vintage style appliances or sticking to traditional cooking methods, this style is for you. You’ll have to mix, knead, and feed the dough through the machine all on your own. All manual models feature a hand crank that helps you manually feed the dough through the rollers. Some manual models feature a motor function option that will crank for you. All manual styles come with a clamp to keep the machine secured to your countertops. This helps you get a better grip while you crank. Similar to the electric model, manual models come with different pasta shape options. Although you’ll only be able to make flat shapes like fettucini, spaghetti, linguini, and solid sheets with a manual model. Now that you know what pasta maker model options you have, let’s go over the basics you should consider before making your purchase. The build quality refers to both the quality of materials used and the craftsmanship. You can definitely make quality pasta with a cheaper machine, but it likely won’t last you as long. A well made pasta maker should be able to last you years. Some will last a lifetime with the right cleaning and maintenance. Look for brands with good appliance making reputations. Keep in mind that just because a machine is “made in Italy” doesn’t automatically mean it’s made with quality. Quality machines will be made with high quality materials, like stainless steel, and come with a manufacturers warranty. Keep in mind that while plastic discs for making different pasta shapes are cheaper, they won’t last as long as stainless steel ones. Plastic discs also affect the texture of the pasta. Pasta noodles made from plastic discs often aren’t as smooth. Manual pasta makers should all come with a clamp and rubber feet. The clamp secures your machine to the kitchen counter. This helps you get a better grip while you crank. Rubber feet will further secure it to prevent any slipping. Although the aesthetic may vary, most clamp styles are all the same. An open hinge is secured around the width of the counter by tightening a screw with a rubber knob at the end. If the manual machine you’re considering doesn’t include a clamp, don’t buy it. 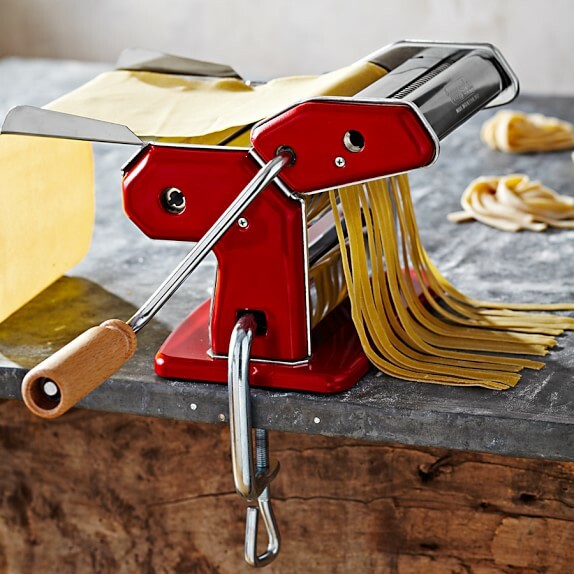 All pasta machines make it easier to prepare home made pasta than the old school way- by hand. But manual and electric models vary drastically in how easy they are to use. They can also yield different results. 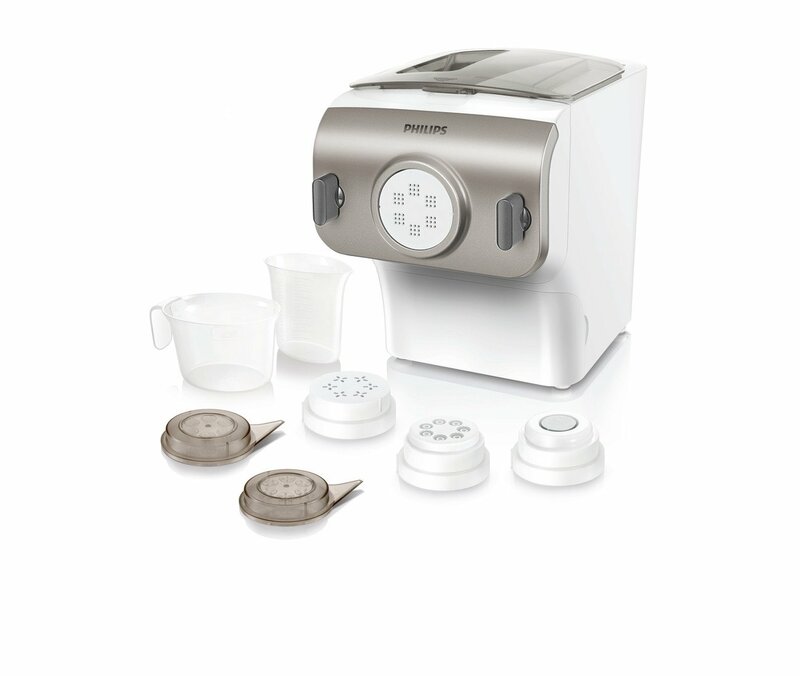 An automatic or electric pasta maker mixes, kneads, and feeds the dough through your chosen pasta shape for you. Manual pasta makers require you to mix, knead, and roll out your own dough. Once the dough is ready you’ll have to feed it through the rollers with the hand crank. Some manual model feature a motor function that cranks for you. While electric machines require a lot less effort than manual ones, figuring out how to use all the different functions can still take some practice. Aside from being able to make different pasta shapes and styles, a good pasta maker should be able to adjust for at least 4-5 different pasta thicknesses. Thickness settings on manual models can be adjusted by increasing the distance between the feed rollers. You can widen the or tighten the rollers using a knob on the side of the machine. Electric models come with control setting where you can select the thickness before the pasta making starts. Some automatic machines come with up to 9 different thickness options. The feed width refers to the amount of space you’re able to adjust for between the rollers. It’s an important part of getting your pasta to your desired thickness, but only applies to manual models. Manual models have two rollers that rotate as you feed the dough through them. You rotate the rollers by using the hand crank. To get the best pasta thickness (no matter what size you’re going for) you always want to start on the widest setting for the first pass. For thinner pasta you shorten the feed width for the second, and even third pass. You can adjust the feed width using a knob on the side of the machine. Once the pasta is to your desired thickness you can cut it into whatever shape you want. Or even stuff two solids sheets with filling and then cut and crimp into ravioli. A pasta maker is a necessary tool for making pasta at home, but having the right accessories and attachments can make the process even easier. Whether you buy a manual machine or an electric one, you’ll likely want to purchase a few accessories. Which ones are necessary? 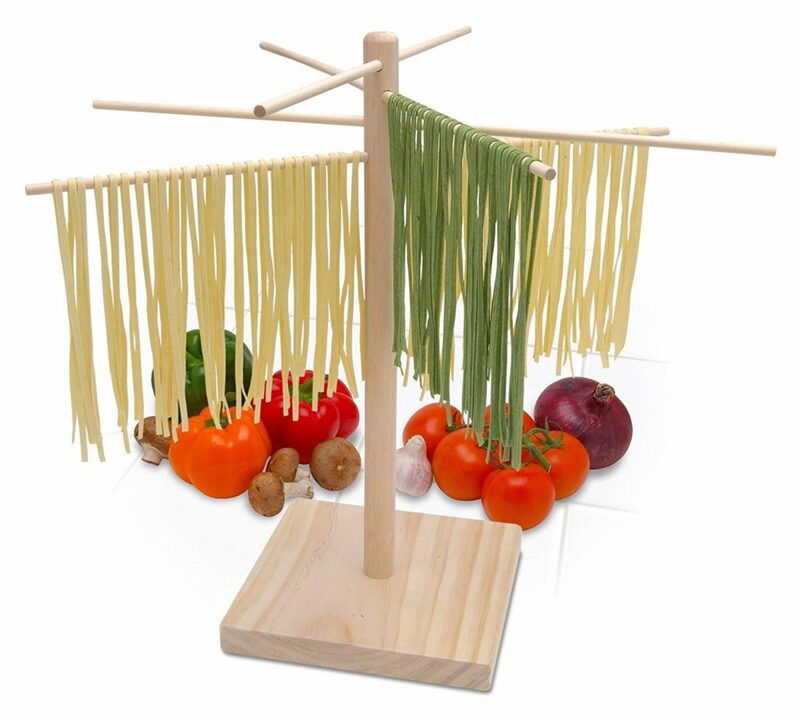 A drying rack, a pasta cutter, and a stainless steel scraper are ideal pasta making tools. You can also consider buying attachments like extra rollers and cutters for manual machines. Or more pasta discs in different shapes like macaroni and rigatoni, for electric models. 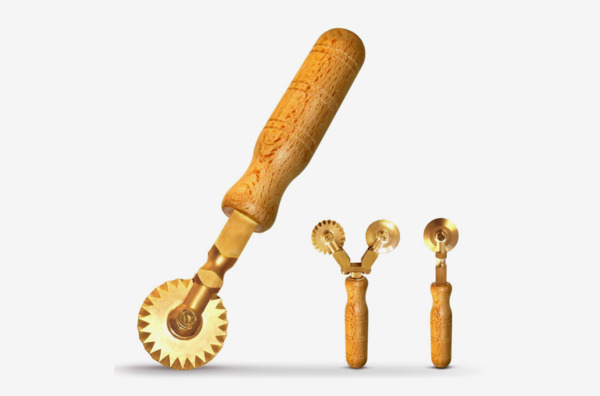 A pasta cutter wheel is a tool you’ll want to have if you chose a manual pasta maker. After getting your pasta sheets to your desired thickness you hand cut them into different shapes or use them to crimp ravioli sheets together. A drying rack is another accessory that’s handy to have around when using a manual model. After your pasta’s done you’ll need to let it dry before boiling it in water. Opt for a wood dryer like the one from Bellemain above. 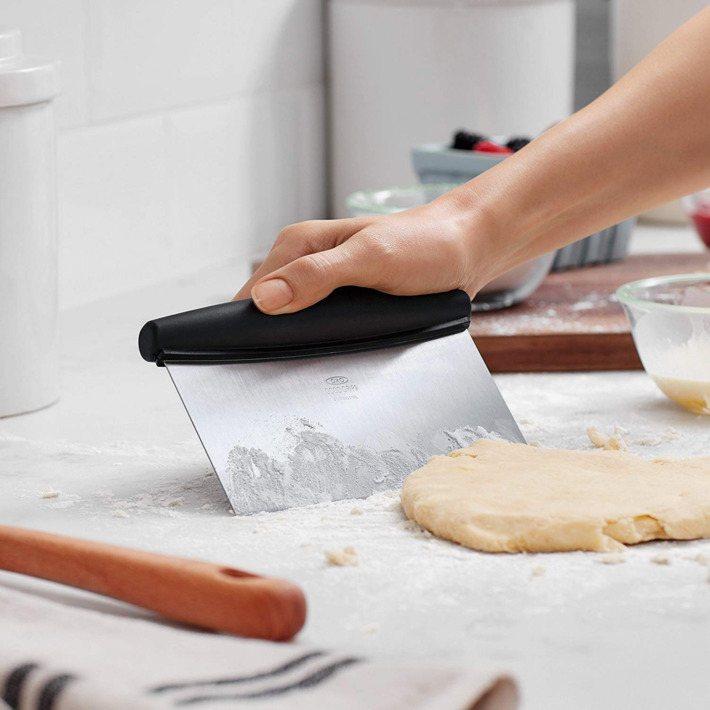 A stainless steel dough scraper is a useful pasta making tool to have when you’re making your own dough from scratch. You’ll be making a lot of homemade pasta dough when using a manual mode. This accessory helps you mix, knead, and even cut the past dough before feeding it through your machine. Owning a pasta maker might be convenient, but cleaning one often isn’t. Because both manual and electric machines have a lot of nooks and crannies you’ll want to have a dry brush on hand to help clean out those hard to reach corners. Machines that come with detachable parts are by far the easiest to clean. Dishwasher safe parts are even better. When buying a pasta maker checks what reviews say about the ease of cleaning and make sure the product description clearly states that parts like rollers and discs are detachable from the base. 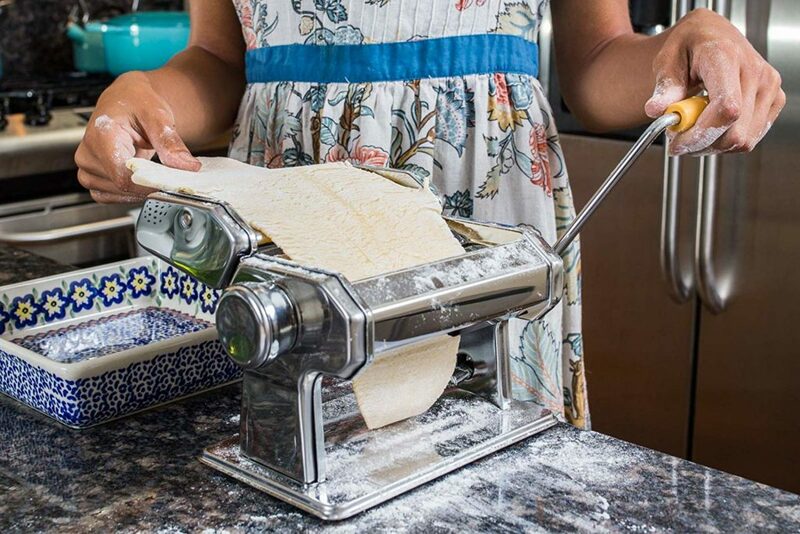 If you love pasta, a pasta maker will quickly become one of your favorite kitchen appliances. 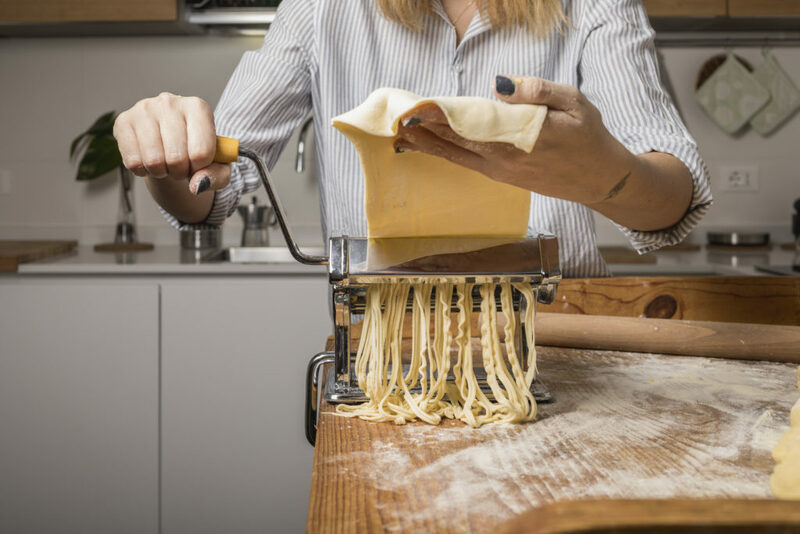 Whether you choose a traditional manual machine or an updated electric model you’ll be able to make fresh pasta noodles at home in a variety of shapes and sizes. With the right cleaning and maintenance, a quality pasta machine will last a lifetime.